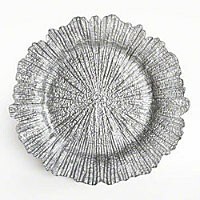 ChargeIt by Jay Glass Reef Silver Charger Plate 13"
Home > Products > ChargeIt by Jay Glass Reef Silver Charger Plate 13"
Set a modern eye-catching table with the ChargeIt by Jay Glass Reef Silver Charger Plate. Featuring a unique coral reef design and glamorous silver shade, this charger plate is an excellent addition to wedding receptions, engagement dinners, and other upscale catered events. This charger provides ample space to beautifully frame dinner plates, platters, and bowls. Made from premium quality glass, this charger plate boasts a delicate look that belies its exceptional strength and outstanding durability. Combining style, durability, and functionality, this charger plate not only complements any table decor but also prevents spills and mess. This chic and stylish charger plate must be hand washed only.